These are some of the Ever Lovin', Blue Eyed Thing's most notable loves over the years, and all of them great. Jennifer had suffered a dreadful accident and needed a blood transfusion badly, and Bruce was by far the best person she and her doctors could turn to. It certainly helped her out, but, it also had the effect of giving her similar powers to Bruce's, although in her case, she could usually control her metamophosis better than he could. Initially, she had usually concealed her identity as the She-Hulk when fighting crime, but later, when she turned almost permanently into her green-skinned form, she stopped hiding her secret identity and went public about it, becoming a celebrity in contrast to her cousin Bruce, who was usually considered more of a threat to society. Her team affiliations are usually the Avengers, but when Ben left the FF, she took his place there for at least two years until he returned. Since then, she's returned to working with the Avengers whenever on a team. She and Ben have sometimes been quite an item together, and, if anything, she's certainly of the hottest, smartest, and sexiest women in the Marvel Universe, and has had at least three solo series in the past years, with the one from 1989-94 being the longest running. She usually works best in tongue-in-cheek adventures, which was certainly the angle of her second shot at a solo book. This fairly tall alien woman is considered the best bounty hunter in the galaxy. She was originally sent to Earth to capture Caledonia, Franklin Richards' nanny who had escaped custody of the Captain Britain Corps. However, she met some resistance, before being attacked by Pluto and his forces. Bounty ended up aiding Caledonia, Valeria, Allysa, Franklin and the family dog in stopping Pluto. Upon his defeat, Bounty fell hopelessly in love with the Thing. However, the Thing didn't feel the same way for her, leaving Bounty to take off and running right into Spider-Man, whom she teamed up with to help a young couple in escaping from the two street gangs they were part of, and wanted to get away from. 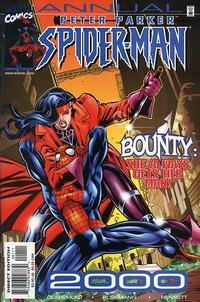 Despite a mutual attraction with each other, Bounty felt that Spider-Man wasn't enough for her. She then took off into space awaiting her next assignment and looking for more adventures. Sharon was born and raised as an "army brat," her father being a United States Army officer. She often disappointed her father because of his unattainably high expections of what he wanted to be his son/daughter. She was enrolled in military school as a teen, but was expelled soon afterwards for refusing to testify against a cheating schoolmate. Her father died a year later, still mad at her for that. Sharon spent the next ten years learning physically demanding skills such as mountain climbing, scuba diving, and ski-jumping. Eventually she began to earn money for these types of skills such as lion taming, performing movie stunts, and stunt-riding motorcycles. It was during this last occupation that Sharon met Ben Grimm, who quickly developed feelings for her. Around this time, Sharon met Auntie Freeze, who offered her a job as a female wrestler with "The Grapplers" if she would be willing to have her strength artificially augmented. Dr. Karl Malus began giving Sharon treatments until she tried to escape, feeling that she was cheating herself and her father. She still started working with the Grapplers until Auntie Freeze found out that Sharon missed the last treatment which would have made her addicted to the drug. The Thing helped Sharon escape and shortly thereafter offered her membership in the Fantastic Four. Shortly after she joined the FF, a shuttle accident caused herself and Ben to be bombarded by cosmic rays which mutated them both. Sharon became a female version of what the Thing first looked like. She was eventually treated, but didn't help her for long and she mutated even further into a more Hulk-like beast. This transformation also began limiting her mental capacity and she broke free of Reed Richards' lab and was last seen roaming the open countryside. She appeared in Fantastic Four #29 in 2000 as part of one of the incarnations of the Frightful Four, battling her former teammates that time. Her current whereabouts are unknown.